I don't mean to...seriously. 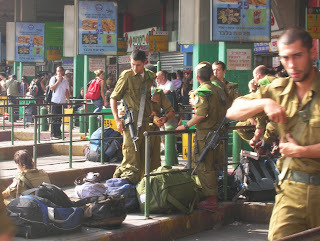 And I don't want to give the impression that Israel is some crazy war zone, dominated by conflict and terrorism. In other words, I don't want to perpetuate the image of Israel you see on CNN. In contrast to what the media would have you believe, things are actually surprisingly "normal" here...people just going about their lives, as they would in any similarly industrialized place. That said, there are definitely moments when I look around and think to myself "hmm...I'm definitely not in Kansas anymore [or Iowa, in my case]." The other night I was playing Frisbee on a team that was made up of: 2 Israelis, 1 Jordanian, 1 Palestinian, and 1 American [that would be me]. That fact, in and of itself, is remarkable enough, but maybe even more interesting was how it was an ongoing topic of conversation throughout the entire game...as if we were all jokingly translating cultural stereotypes into Frisbee truisms: Arabs are prone to erratic displays of physical aggression; Americans seem nice, but you have to watch out for the pre-emptive strike; and Israelis...well, if you cross them, they'll destroy you...or at least try to. It's strange also, to realize how quickly you can get accustomed to that underlying sense of conflict. 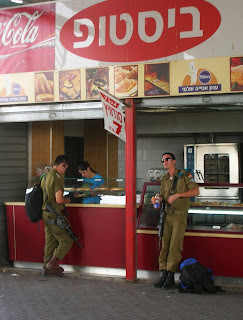 For example, yesterday afternoon I took the bus to Be'er Sheva. 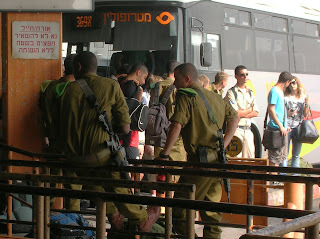 Since it was Thursday, the bus was packed with armed soldiers because all the kids in the IDF go home for the weekends. 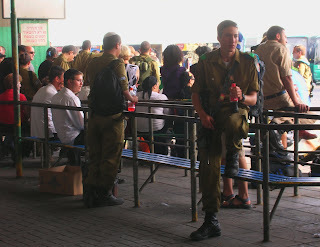 At the bus station in Be'er Sheva there were kids with guns...everywhere...and it really did seem totally normal. But, I took some pictures anyway, because I remembered it seeming decidedly NOT normal when I saw it for the first time.